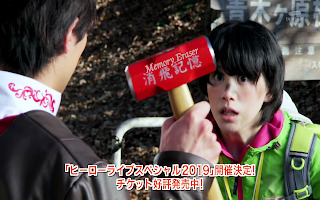 Another year, another Super Sentai season is born. Our 2019 team is the 4th dinosaur themed team which have produced some of the best seasons so far and these silver based costumes are pretty cool. Sadly, this is actually a bad sign. After 5 under performing seasons in a row, Super Sentai is in trouble and could be facing cancellation. It seems Toei is now trying to recreate their last big success, Kyoryuger by going back to Dinosaurs and even the same colors for the core team. With that in mind, anything could happen so let's drive right into this new installment. Click "read more" for the full coverage. 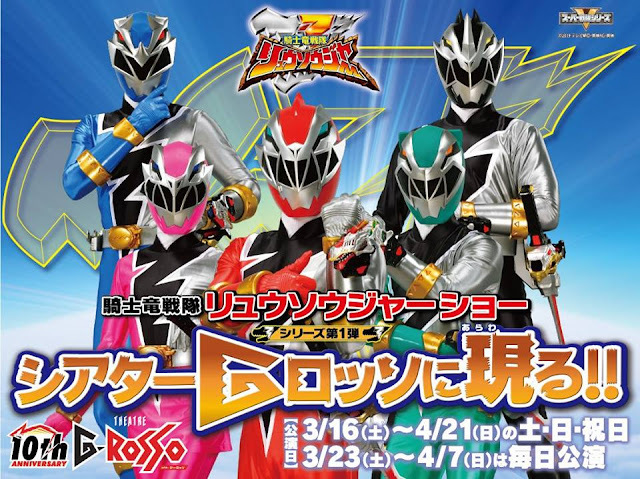 Absolutely no time is wasted with this season, the very first thing we see is 3 people given the title Ryusoulger from their masters. The masters themselves aren't given names and are just refereed to as Master Red, Master Blue, and Master Pink. 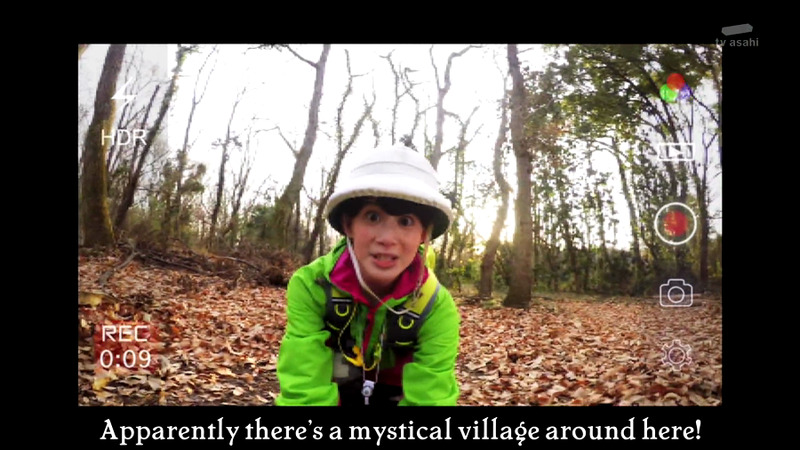 Out of nowhere, the episode then cuts to some self filmed nature show by a girl named Ui. I'm already lost. Koh gets a lecture from Master Red over talking with this girl filming because he is not supposed to talk to strangers and focus on his mission to defeat Minosaurs (the name of this seasons monsters). Some weird multi-dimension thing is going on here. After these very fast events, this Minosaur and what can be assumed as the footsoldiers of this season appear and attack the film maker. However, the Minosaur and foot soldiers are instantly defeated by two red rangers who appear out of no where. Seems both student and master get to be the same ranger. Cut to intro. Feels like these newer seasons really just want to get all the exposition out of the way and get to the good parts. 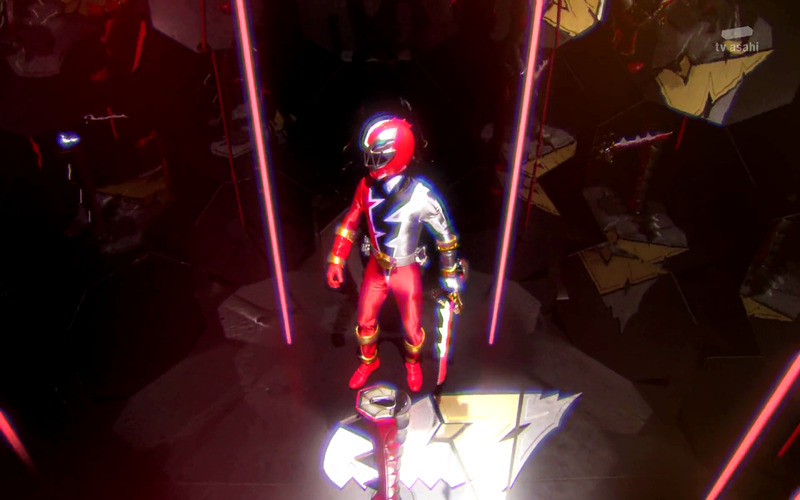 One intro later, the two red rangers are fighting off some foot soldiers. 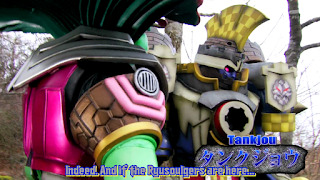 (They still have not given the foot soldiers a name, but a quick search calls them Drunn Soldiers.) 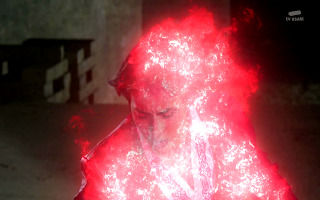 In the middle of the fight, Master Red tells Koh to use his Tsuyosoul. Looks like we got another power source arsenal. 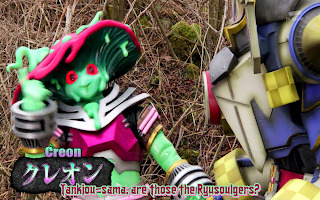 These TsuyoSouls remind me an awful lot of the Zyudenchi from Kyoryuger. 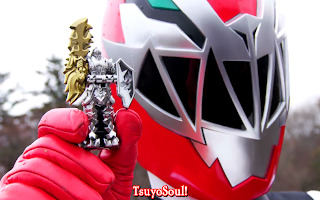 Also the ranger keys from Gokaiger. Two very successful seasons. Koh proceeds to take out a bunch of Drunn Soldiers with his now powered up form in a pretty cool fight scene. Then, he busts out another TyuyoSoul, this time a red one. This season really wants to get all of this establishment out of the way as fast as possible. The red Tysuyo Soul creates his finishing move that wipes out the remaining Drunn Soliders in one big triangle shaped explosion. Was actually a pretty cool effect that wasn't ALL CG this time. What comes next? Even more establishment. Two of the main villains show up now to give some more exposition. They tease the existence of a temple and that is about it. Oh the irony. This first episode is doing all the establishment that I also need to do for any of my first episode coverage. Cutting back to Ui, a quick scene to introduce her father is shown where she apologizes over the phone about not being able to come home. A lot of information is being thrown around. But, I have a feeling all these characters are going to play a role later. Another abrupt cut later, the three rangers and three masters appeal on some floating island to discuss the attack the two reds faced. 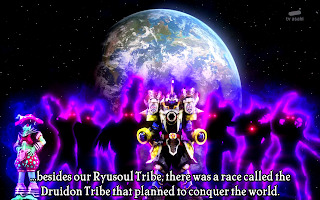 Now, the villains get a proper introduction; they are an evil tribe back from the dinosaur era called the Druidon Tribe who are planning to conquer the world. However, when the meteor that wiped out the dinosaurs struck, they fled into space and waited 65 million years to come back. Doesn't get more straight forward, than that. Now that the Druidon Tribe is back, they are after a great power that is sealed within a temple called the Kishiryuu. 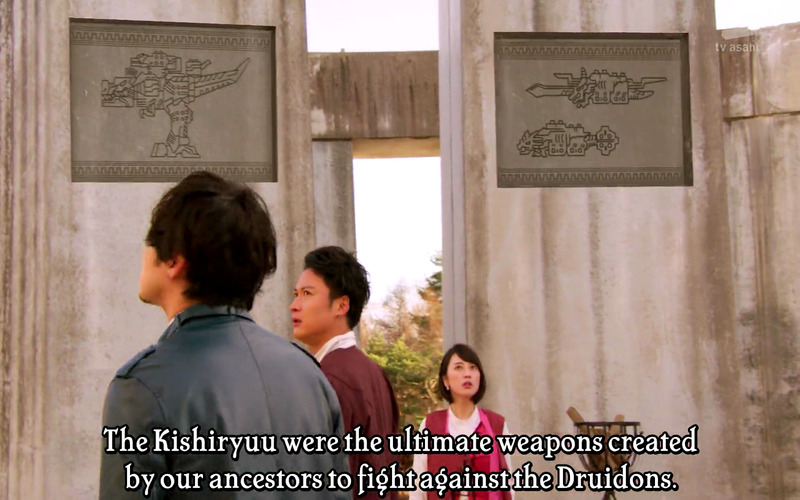 This is the same temple that is the source of the Ryusoulger's powers. 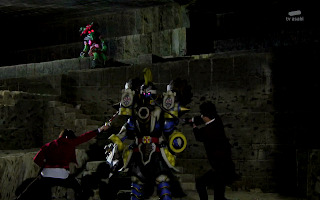 Outside the temple, while training and re-establishing the plot, the 3 rangers get their tropes established. Koh is the over confident one, Melto is good with a sword and the serious one, and Asuna has super human strength. 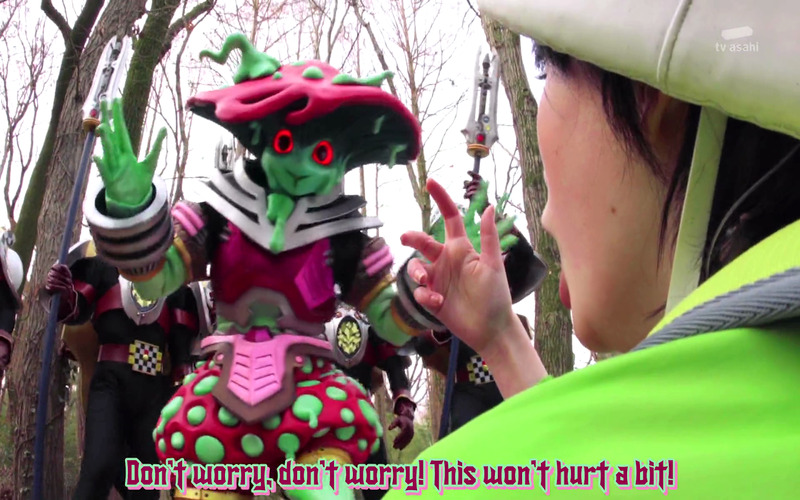 (And the one girl ranger of course.) At this point, Ui is spotted spying on the rangers and starts bombarding them with questions. She is caught by the elder mentor character (whose name has yet to be said) and is ordered to be kicked out and have her memories erased. It's a sledge hammer! Okay, that was pretty funny. With a giant on the loose the masters decide it is time to awaken the Kishiryuu. So, Koh and Master Red rush towards the temple while the two blue and two pink Ryusouglers try to fight off the giant. They actually manage to knock the giant down, however a Druidon breaches the temple which interrupts their powers and forced all of them to unmorph. Now, the situation looks grim. Things are finally getting interesting. 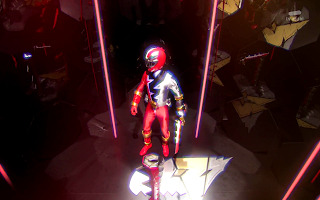 Inside the temple, Koh and Master Red attempt to fight Tankjou, but without their powers they are completely overpowered and receive a massive beating. 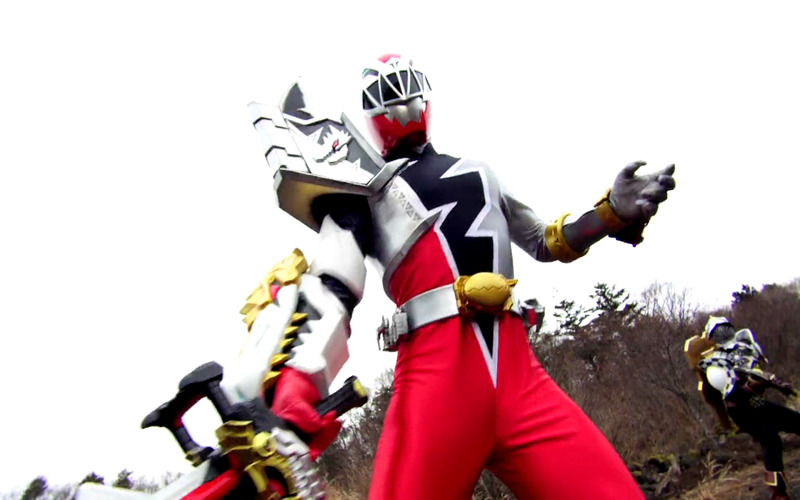 I have a lot of respect for rangers who are willing to fight unmorphed. While down and out, Tankjou taunts them, telling them to give up but Koh refuses and delivers what can be predicted to become his catch phrase/moto. 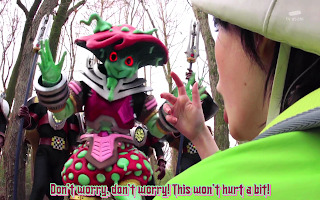 Tankjou charges up for a finishing blow, but Master Red rushes over and uses another TyuyoSoul to protect Koh and takes the full blast of the attack himself, possibly killing him. 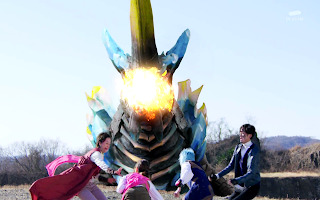 Meanwhile, back outside, a very similar scenario occurs with Mater Blue, Master Pink, and their two ranger students respectively. The gaint Minosour prepares a final blow but the two masters throw their students out of the way in time taking the full blast themselves. No question about it this time, both Master Blue and Master Pink are not only killed by the blast, but completely obliterated without a trace. Both Melto and Asuna mourn the loss and struggle to maintain a will to fight. Back inside the temple, Master Red is still barley alive. He tells Koh that their souls are one before dying in his arms. Tankjou comes back looking to finish off Koh when Master Reds body turns into red aura and goes inside of Koh's TsuyoSoul which restores his powers. 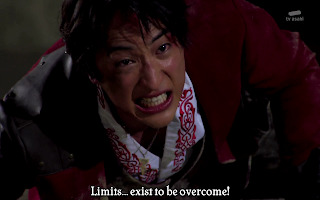 Back at full strength and full of rage, Koh henshins, attacks Tankjou and overpowers him. Looks like a victory for red, until something from space blasts the temple, making it start to collapse, and causes Tanjou to retreat but not before swearing the Druidon will win. As the temple crumples, the walls start to glow and Koh finds himself inside the cockpit of Kishiryuu. 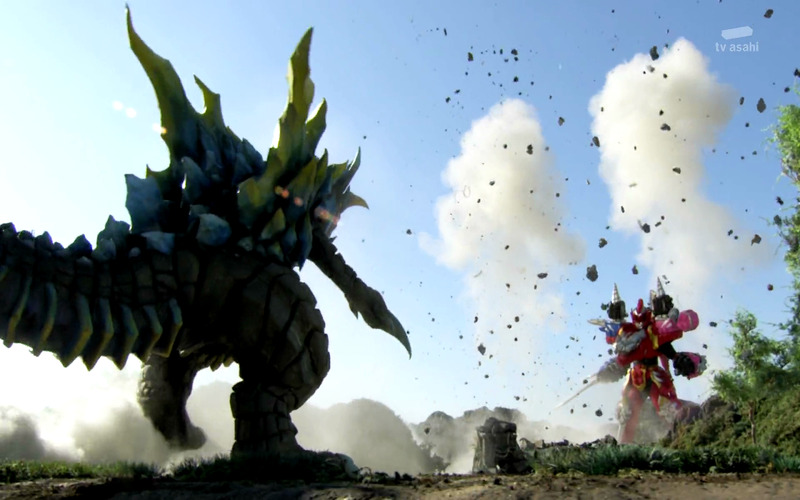 The temple is destroyed and Kishiryuu emerges from the rubble ready to fight the giant Minosaur. Wait, why are pink and blue already attached? Also, are those Lego brick bump? The giant battle is quick, but surprisingly well done. 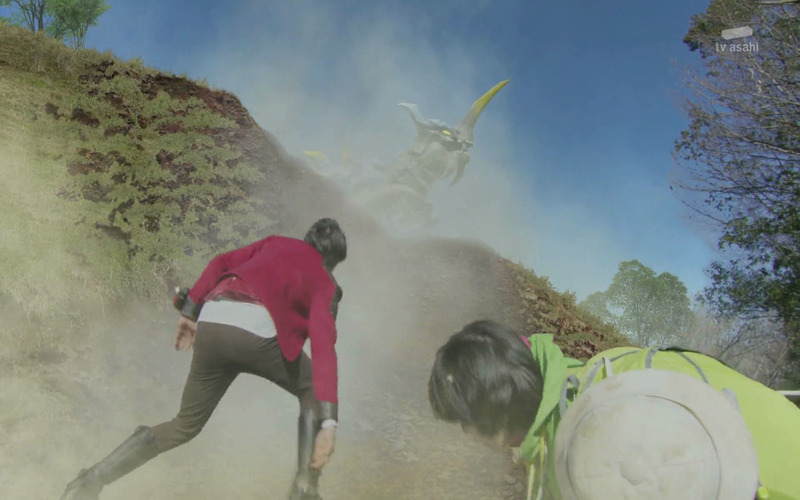 Kishiryuu runs around a lot, dodging attacks and striking back. Turns out, there is a reason for those Lego bumps, this mech has drills that detach and attach at any point of its body allowing for different angle attacks. The enemy actually fought back, I'm so happy. 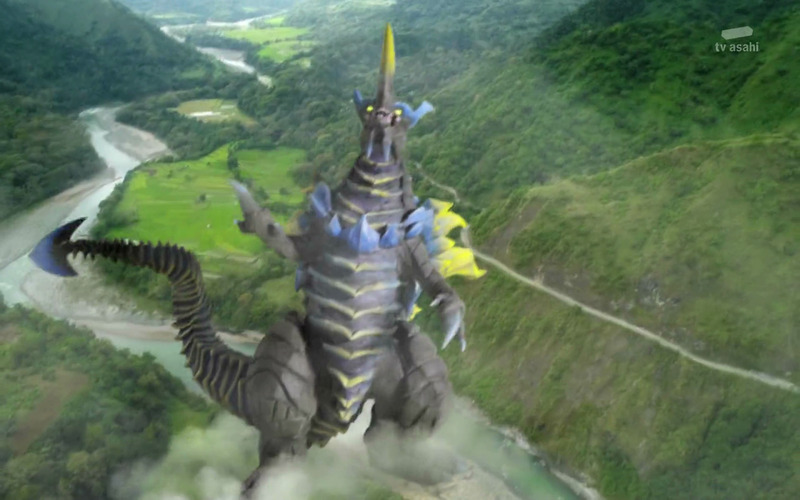 This fight ends with a victory for the Ryusougers. Oh no! A Megazord that does an "up-yours" jester when it wins. 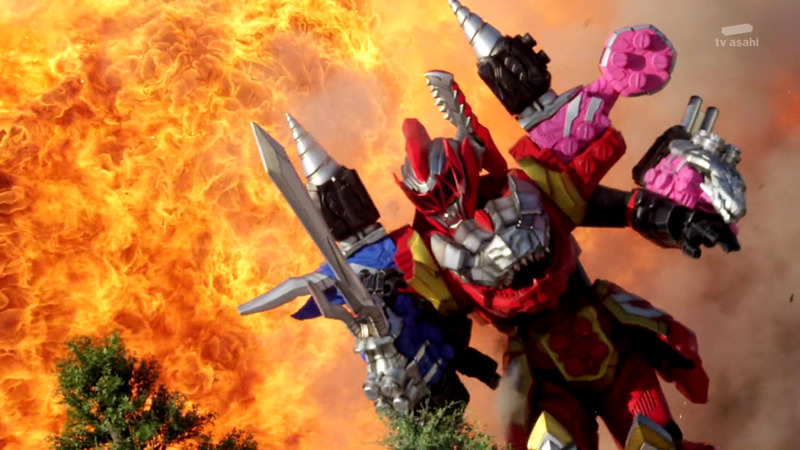 We will never get Power Rangers Dino Souls now. The episode ends on a serious note. 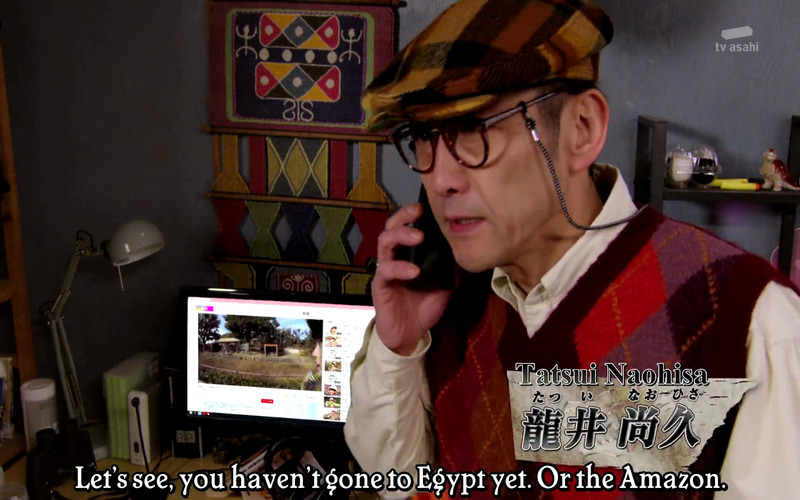 Our elder mentor figure (whose name still hasn't been said) appears and tell the three rangers that their powers living on even without the temple and that there is a green and black Ryusoulger out there that they need to join up with. All three current Ryusoulgers remember that their masters souls are now inside their TyuyoSoul and they do the first group henshin/roll-call ending the episode. This episode is kind of mixed. The first half was all over the place and confusing, but things picked up greatly for the second half. Luckily, the confusing bit was due to them trying to introduce everything as quickly as possible which leads me to believe that this will not be a reoccurring problem. On a big positive note, the fight scenes and villains are a big improvement over the last season. They are actually fighting back and feel like a genuine threat. Story wise, it is taken much more seriously than recent seasons, but has a couple of issues. First of all, the flashback said that the evil tribe, Druidon, fled Earth 65 million years ago and showed the Earth getting hit by a meteor implying it was the same one that wiped out the Dinosaurs. However, they never explain why the Druidon took so long to come back, which is especially confusing considering this is the 4th time that Dinosaur spirits where in effect. Second, issue is the Masters; I get they were trying to do a tragic beginning for the characters, but the 3 of them seemed a little young for the roles. All 3 masters barely looked 10 years older than the rangers, if that, seems a little early to be passing on the torch. On that note, what exactly was being passed on? The rangers kept saying "now it's our turn to fight" but there was never any implication that the masters were involved in any fight. 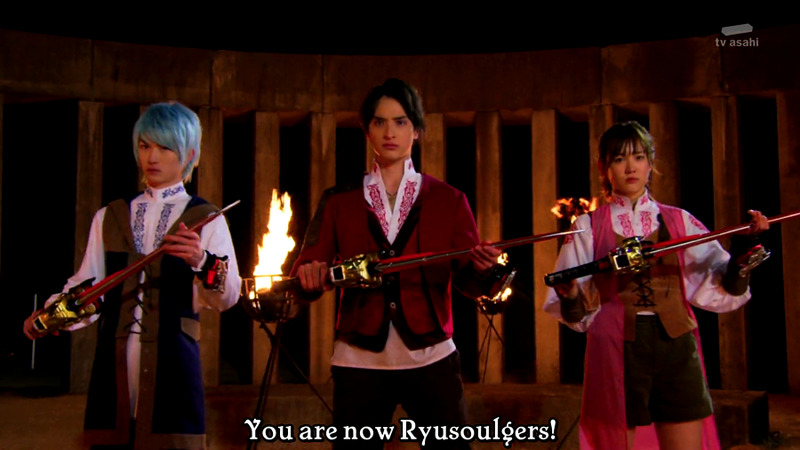 Lastly, why were both master and student able to henshin if they passed on the TyuyoSouls? But, I suppose these can be dismissed as nitpicks and could be explained in future episodes.